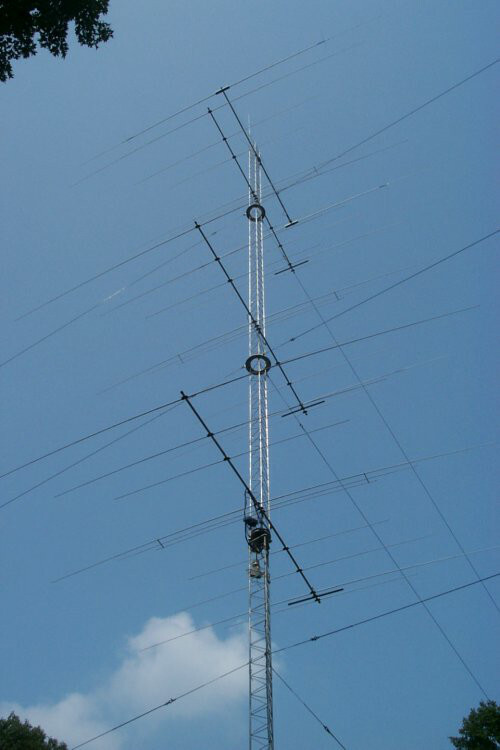 W0YVA - Bob Sullivan's stack of three Bencher Skyhawks on his 115-ft rotating tower. Visit Bob's site at http://www.isquare.com/hardware-tower.htm for a pictorial story of his tower installation by Array Solutions-Jay, WX0B and Custom Metal Works-Paul, K7PN. "It's gratifying," Bob comments, "to be told the difference in signal strength with various combinations of the stack." "I traded big Telrex 48-ft boom monobanders for these Skyhawks and am convinced I have a better antenna system." Thanks you guys for a great installation! Jay, your Stackmatch and Ratpak were perfect for this installation and work great. Paul, the rotating tower hardware is awesome and more impressive that I can say. I am definitely a happy user!